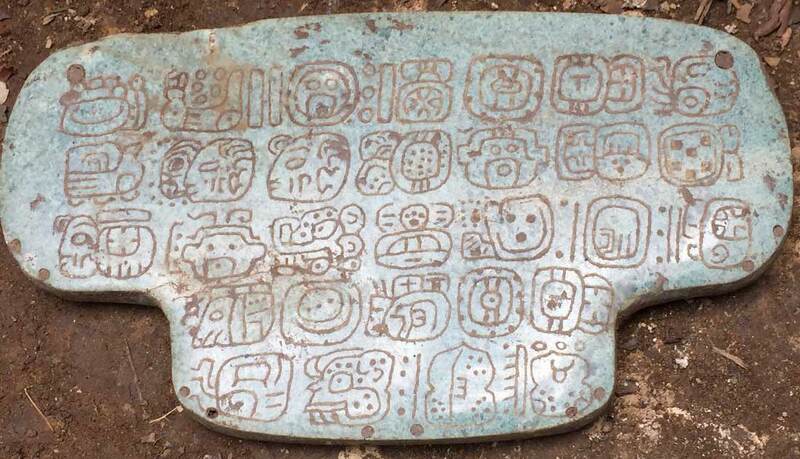 “It was like finding the Hope Diamond in Peoria instead of New York,” said Braswell, who led the dig that uncovered a large piece of carved jade once belonging to an ancient Maya king. “We would expect something like it in one of the big cities of the Maya world. Instead, here it was, far from the center,” he said. The jewel—a jade pendant worn on a king’s chest during key religious ceremonies—was first unearthed in 2015. It is now housed at the Central Bank of Belize, along with other national treasures. Braswell recently published a paper in the Cambridge University journal Ancient Mesoamerica detailing the jewel’s significance. A second paper, in the Journal of Field Archaeology, describes the excavations. 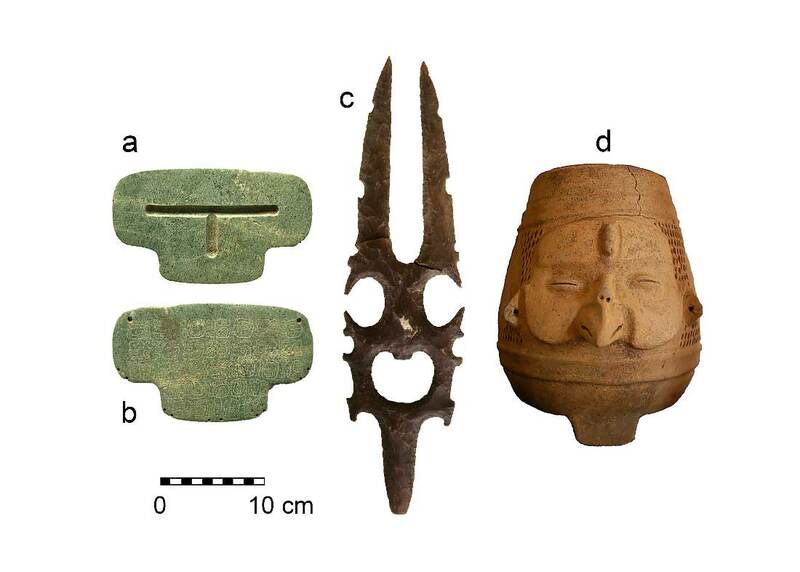 Three of the objects buried together by the Maya around A.D. 800. Why were they entombed? Field and artifact photos courtesy Braswell. 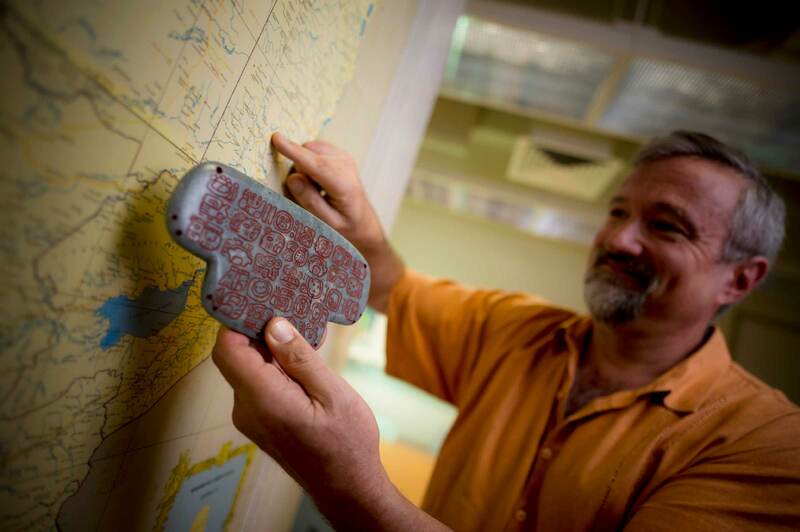 The pendant is remarkable for being the second largest Maya jade found in Belize to date, said Braswell, a professor in the Department of Anthropology at UC San Diego. The pendant measures 7.4 inches wide, 4.1 inches high and just 0.3 inches thick. Sawing it into this thin, flat form with string, fat and jade dust would have been a technical feat. But what makes the pendant even more remarkable, Braswell said, is that it’s the only one known to be inscribed with a historical text. Carved into the pendant’s back are 30 hieroglyphs about its first owner. “It literally speaks to us,” Braswell said. “The story it tells is a short but important one.” He believes it may even change what we know about the Maya. Nim Li Punit was abandoned within a generation of the construction of the tomb that held the jade pendant. On the southeastern edge of the ancient Maya zone (more than 250 miles south of Chichen Itza in Mexico, where similar but smaller breast pieces have been found), Nim Li Punit is estimated to have been inhabited between A.D. 150 and 850. The site’s name means “big hat.” It was dubbed that, after its rediscovery in 1976, for the elaborate headdress sported by one of its stone figures. Its ancient name might be Wakam or Kawam, but this is not certain. The pendant is in the shape of a T. Its front is carved with a T also. This is the Mayan glyph “ik’,” which stands for “wind and breath.” It was buried, Braswell said, in a curious, T-shaped platform. And one of the pots discovered with it, a vessel with a beaked face, probably depicts a Maya god of wind. The most important aspect of the jewel, Braswell says, is a historical text of 30 hieroglyphs on its back, a private message seen mostly by the king who wore it. By the year A.D. 800, the pendant was buried, not with its human owner, it seems, but just with other objects. Why? The pendant wasn’t a bauble, Braswell said, “it had immense power and magic.” Could it have been buried as a dedication to the wind god? That’s Braswell’s educated hunch. The inscription on the back of the pendant is perhaps the most intriguing thing about it, Braswell said. The text is still being analyzed by Braswell’s coauthor on the Ancient Mesoamerica paper, Christian Prager of the University of Bonn. And Mayan script itself is not yet fully deciphered or agreed upon. 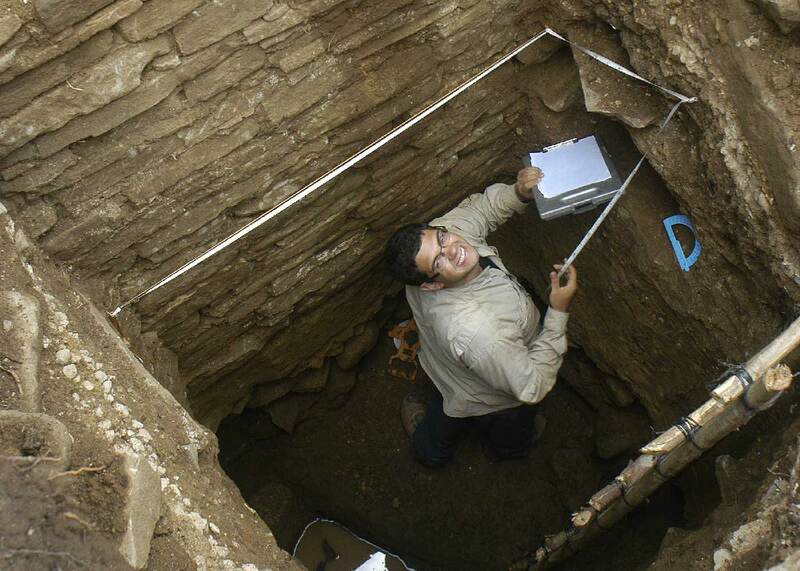 Graduate student Mario Borrero excavates the substructure of the palace building which held the tomb. But Prager and Braswell’s interpretation of the text so far is this: The jewel was made for the king Janaab’ Ohl K’inich. In addition to noting the pendant’s first use in A.D. 672 for an incense-scattering ceremony, the hieroglyphs describe the king’s parentage. His mother, the text implies, was from Cahal Pech, a distant site in western Belize. The king’s father died before aged 20 and may have come from somewhere in Guatemala. “It tells a political story far from Nim Li Punit,” Braswell said. He notes that Cahal Pech, the mother’s birthplace, for example, is 60 miles away. That’s a five-hour bus ride today, and back then would have been many days’ walk—through rainforest and across mountains. How did the pendant come to this outpost? While it’s possible it had been stolen from an important place and whisked away to the provinces, Braswell doesn’t think so. He believes the pendant is telling us about the arrival of royalty at Nim Li Punit, the founding of a new dynasty. The writing on the pendant is not particularly old by Maya standards, but it’s the oldest found at Nim Li Punit so far, Braswell said. It’s also only after the pendant’s arrival that other hieroglyphs and images of royalty begin to show up on the site’s stelae, or sculptured stone slabs. It could be that king Janaab’ Ohl K’inich himself moved to Nim Li Punit, Braswell said. Or it could be that a great Maya state was trying to ally with the provinces, expand its power or curry favor by presenting a local king with the jewel. Either way, Braswell believes, the writing on the pendant indicates ties that had been previously unknown. 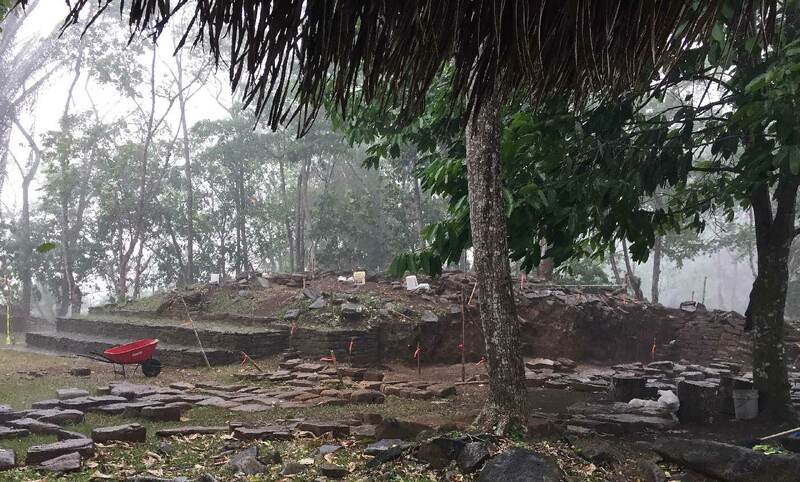 We may never know exactly why the pendant came to Nim Li Punit or why it was buried as it was, but Braswell’s project to understand the site continues. He plans to return in the spring of 2017. This time, he also wants to see if he might discover a tie to the Caribbean Sea. After all, that’s a mere 12 miles downriver, a four-hour trip by canoe.